I thought I’d join in with Bacon and Fozzie’s Shopping around the World feature this time around. The idea is post the costs of various items so that we can see how much things cost around the world! Here’s the list. My prices come to you from Cornwall, South-West England. I always buy Andrex Puppies on a Roll. It’s a bit more expensive but I don’t care. It absolutely has to be Puppies on a Roll. Because it’s cute. Even when I was saving up to buy a house I splurged on Puppies on a Roll. Why? Because it’s cute. One time I couldn’t get Puppies on a Roll and I was most dismayed. That’s a picture of a 4 pack but I always buy a 9 pack (sometimes you even get 3 rolls free!). A 9 pack costs me £4.49 (€5.67, US$7.60). Small problem here – what’s a “regular package”? Come to that, what exactly is “ground beef”? Minced beef I guess? I’m going to post the price of the stuff I buy – store-brand lean minced steak beef, 500g. That costs £4.00 (€5.06, US$6.77). I haven’t bought these for years, but I located several examples for all sorts of prices. They don’t come in packages in this country, generally. Proper sausages (i.e. the Great British Banger!) come in packages, but hot dog sausages come in tins, usually in brine. This is probably the sort of thing I would buy, were I to buy them, and this tin of 8 hot dog sausages would set you back a very reasonable £1.29 (€1.63 , US$2.18). Tell you what’s really nice – hot dog sausage, slice along the sausage but not all the way through, fill with Marmite so it melts and stuff it in bread. Mmm! Bit messy, mind. Mmm, bacon. I buy store-brand back bacon, 8 rashers, unsmoked (300g) costing £2.55 (€3.22, US$4.31). I don’t think I’ve ever heard of puppies on a roll, but now I want it too! It almost seems like things are a bit cheaper there. Either that or you are a keen shopper getting the best deals you can. Of course it’s hard to tell without comparing average wages and so on – in some countries groceries look very expensive, but then you find out that they get paid a lot more, and vice versa. Your toilet paper is about the same price as ours. Your minced beef is more expensive (but not outrageously so). Your hot dogs look inedible and the British passion for Marmite has to be genetic because I’ve never met anyone from anywhere else that can stomach the stuff 🙂 Otherwise, your store-brand pizza is slightly less expensive and looks yummy. Hard to tell without a taste test. I like the puppies on a role concept because it is such blatant sentimentalist marketing and it works. Cool. That minced beef is “prime”, I would say. I don’t buy it very often so I get pretty decent lean stuff. The hot dogs are pretty bad until you add Marmite 🙂 I love hot dogs, but with “real” sausages, properly grilled on my little one-man George Foreman. 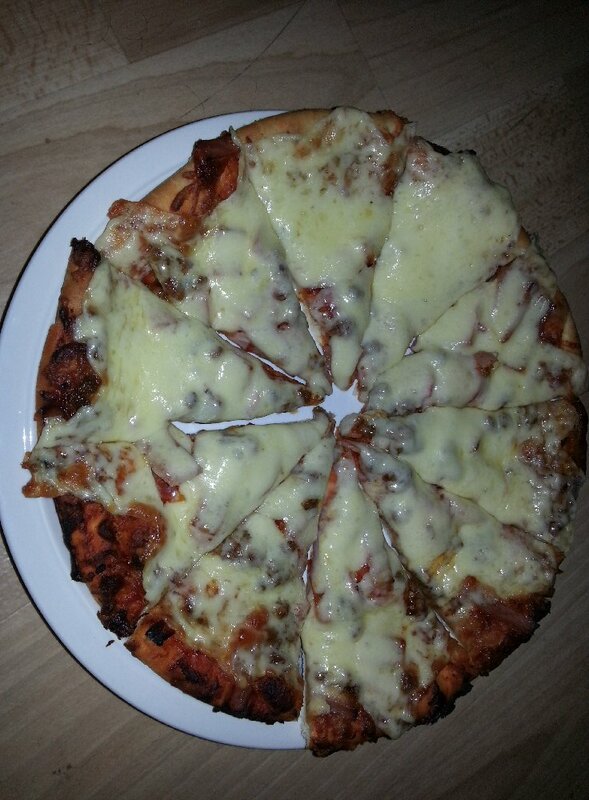 The pizza’s not bad, but there are plenty of much more sophisticated (and expensive) ones you can buy. Andrex has used Labrador Retriever puppies to sell their toilet paper for as long as I can remember. They’re so cute, how can you not buy their brand? 🙂 It’s a British brand, but if you trace it right back up the tree it’s actually American-owned (Kimberly-Clark). According to the font of all knowledge (! ), Wiki, it’s sold in the US as “Kleenex Cottonelle”. But no puppies in the U.S. Same TP otherwise and more or less the same price. Boo, no puppies 😦 That means no Puppy Points so no little stuffed puppies to collect. I think it is very cute that you buy toilet paper that is cute. This has to be the same company you got the stuffed animals from, right? 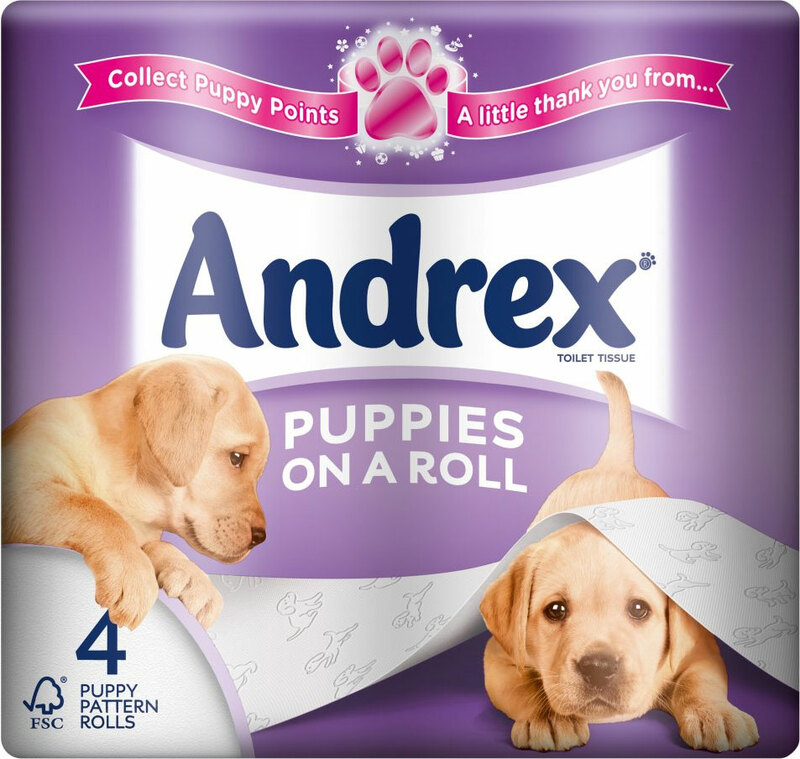 That’s right – you get “Puppy Points” with each purchase of (any) Andrex toilet paper, then you redeem them on their website and they send you a fluffy Andrex puppy of your very own! Now I’m thinking of a story of a group of puppies who go to Vegas and win big, i.e. they’re “on a roll”! Yay stuffed puppy toys 🙂 I’ve really started something here with my choice of toilet paper. OK so Cornwall prices seem relatively comparable to BC – Fraser Valley prices with the exception of TP. Ours is apparently cheaper. We do not have puppies on a roll, but we do have Royale which features cute fluffy white kittens on the package or Purex with lovely flowers on the package (which is far better than their old symbol which was an annoying talking pillow – cuz you know it’s pillowy soft) and numerous other brands that I do not generally buy (like Charmin featuring animated bears). We pay around $10.00 CAD (currently comparable to the USD) for a 24 double roll pack – on sale of course but I only buy it on sale unless completely desperate. I would buy puppies on a roll if we had it here, though I would be slightly dismayed by the concept of puppies and what you do with toilet paper combined into one product. I would totally still buy it though. My toilet paper doesn’t come with any discernible pattern. I feel swindled. I’d start a petition. Everybody needs to treat themselves to cute-patterned toilet paper once in a while. Most supermarkets in the UK have voluntarily removed sweets from the checkout due to the “rising issue of childhood obesity”. Now they try to flog you own-brand insurance and bank accounts instead. We have those adorable puppies on our rolls here in Oz too – and on the television ads. Now you’re making my mouth water! I’m also a big fan of piccalilli and Branston pickle – I always have a jar of both in the cupboard. I’m glad you have the puppies in Australia – it looks like people in the US have missed out! I’m a little concerned — you wipe with puppies? Yeah, but not real ones – too squirmy. We wipe with puppy pictures. It’s the best thing ever! In all the world, only about 50% of British people like it. Everyone else who tries it rolls around swearing and gasping. We tried some out on a German friend when I was living in Stuttgart. Man, you would have thought he was dying, the way he reacted. What a baby. It’s a very tangy, quite salty yeast extract spread. The closest thing I can think of which you may have heard of is Australia’s Vegemite, but Marmite is saltier and tangier. I’m sure it costs more at other stores around here… we’re really good about keeping prices down at Mecca. Plus, the cost of living is pretty low where I live. I’ll bet that same package would cost ten bucks in New York City! I think shoppers here would pay a puppy premium though if the package looked like that! Yeah, I’m sure it costs more in London. I certainly pay a little premium for the puppies! I’d heard that about usage of toilet paper in India but I didn’t know it still happened that way. Interesting DrAli, Unless I saved the puppy points and redeemed them I could not pay more for cuteness. That is frugal me. Prices vary depending where I shop. In the big stores around here prices are mostly the same, they’re still having a price war so no-one can afford to charge more than anyone else! I’m laughing over here, doc! Puppies on a Roll? But yes, cute. Price for 9 is about this same as here – if we get the ones on sale. The beef is about the same here, for regular…I guess that’s 85% lean.